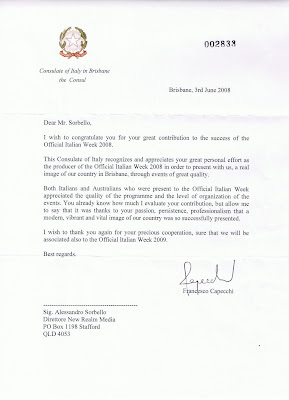 It was a great pleasure to hear the comments of the Italian Ambassador to Australia, His Excellency Stefano Starace-Janfolla when he met with the Italian Week team in Brisbane at Gianni’s Restaurant. The Ambassador thanked the team for the collaboration with the Italian Consulate in promoting Italian Culture via the young Italian/Australian team. It was a real pleasure to meet with Gary at the Italian Consulate, it is rare to meet a person who displays so much obvious passion for his work/art. We too are excited about the collaboration which has commenced this year and which will continue on for the coming 4 years as a minimum.